Our half acres property is located directly on the Big Island's only open-to-the-public Hilo Municipal Golf Course, in the southern part of Hilo. We have our Main House in front and towards the back an 800 sq-ft Studio and Lanai facing East, with a direct view onto our garden and fruit tree orchard. Our orchard contains various seasonal fruits like papayas, starfruit, lychee, Jabuticaba, and more. Our central location gives you great access to all of East Hawaii's various activities. Just 7-15 min. away you have all of Hilo's shopping and dining opportunities. The historic part of Hilo Downtown with it's Hilo Farmer Market, Just Cruisin Coffee, and Ou Thai Food (on the farmers market with great Thai Green Papaya Salad), just mention a small few. Just 10-30 min. away you have access to Hilo's beaches, surfing, hiking, spelunking, waterfalls, and the Big Island's great attraction, the Lava Flowing into the Ocean. Just 25-45 min. away to the South, you have access to the Big Island's Volcano National Park, and Hawaii's Volcano Winery just around the corner. And to the North, the Hamakua Coast's Hawaii Tropical Batanical Garden, Hawaii's only and very quaint Laupahoehoe Train Museum, and the incredible Waipi'o Valley. Or just stay at home and go play a round golf, at the island's only open-to-the-public golf course, the "Hilo Municipal Golf Course". We also include garage parking accommodations to keep you dry, if it rains. We are a family of four. We have a daughter and a son. The house owner is born and raised here on the Big Island. His wife is from Germany. This house is now 30 years owned by the family. It is passed on through the generations of the house owners family. The house itself is an old Plantation house style building. This means it is the old style they build houses here on the island 50 years ago. In the last year the house underwent major renovations and rebuilding to make it much nicer and also a little bid bigger. The location is a nice, secure and quiet neighborhood on the golf driving range. That makes this house and location as a vacation rental quite unique. This apartment is perfect for families. We love it because it is nice and cozy. The view out of the wonderful and special windows in the dinning area show hibiscus flowers in different colors and different fruit trees, also pineapples and taro. There were just two of us in the large space that could be comfortable for 5-6. There’s everything you need if you chose to cook meals, do laundry...Super clean and safe area. The host family are really special welcoming people. Good location to hit up Volcano National Park. A Great Value with Great Hosts! We loved our 2 week stay here! It is as advertised and more! It really is a great VALUE! The neighborhood is quiet and has very low traffic. My wife and I stayed here with my 90 year old mother and it was a great space. The apartment is completely furnished and equipped for a more extended stay. Ingrid and Amon are very friendly and very conscientious hosts. Upon arrival, the unit was super clean and neat. They met all of our need requests and voluntarily made fresh fruit available daily. My sense is that they will go overboard to make their guests feel comfortable. We did have a vehicle to get around with. The driveway is huge and the parking is great. Amon even placed "runway lights" for safe night time access. The entry is covered and very well protected so you don't get soaked trying to get in from the Hilo rain. This was our first stay here but this place will probably be our "Hilo home" from here on out. We felt welcomed! Ingrid was gracious and kind. This vacation home was loaded with all the amenities that one would need. Ingrid is cool! You will not regret a stay at this home. Thanks so much Ingrid! Great hosts. Perfect location. Great neighborhood. Had a wonderful stay with Ingrid and the family. The apartment is very spacious and tidy. Everything you need for a stay in Hilo. Evening walks on the golf course were a bonus. Highly recommend. We stayed 6 nights in the apartment. 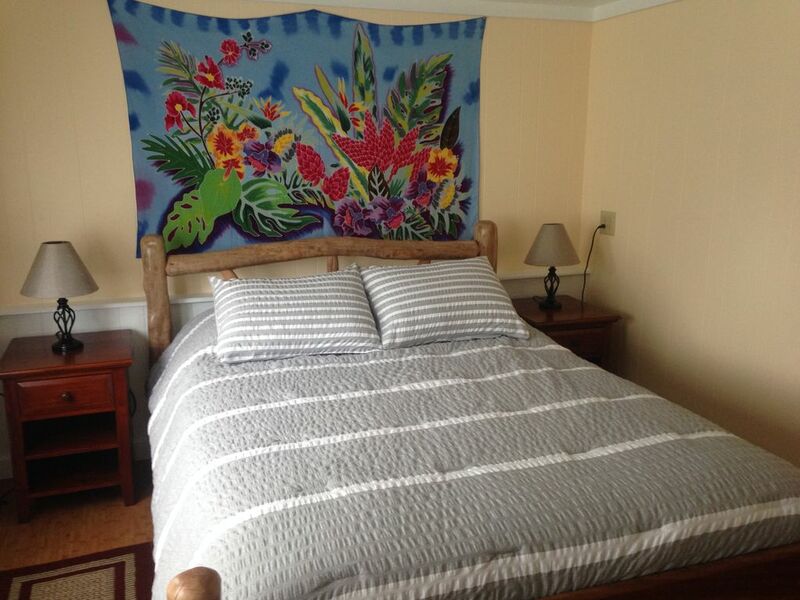 It's conveniently located 10 minutes by car from downtown Hilo in a quiet residential area. Ingrid and Amon, and their family and pets, are very friendly. Ingrid gave us tips on what to do (and not do, since the volcano was acting up) and Amon gave us fruits from the garden. The apartment is cozy and spacious (by our Japanese standard) for 2 people (and could easily host 4). It was a home away from home, especially on those raining days when we came back early from visits. We ask for 50% deposit and balance due upon arrival. Deposit is required to pay by PayPal or with a check. The Balance can be payed with Cash, Check or by PayPal More than 2 adults (over 12 years old) we ask for a $10.- a night per adult additional guest fee.